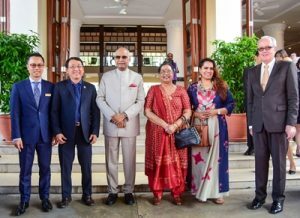 Indian President Ram Nath Kovind and his spouse started the official three-day visit to Vietnam at the Furama International Convention Palace, welcomed by Secretary of the Party Committee of Da Nang city Truong Quang Nghia, attended a banquet in his honour, visit Danang Cham Museum, My Son world cultural heritage in the central province of Quang Nam and the meeting with General Secretary of the Communist Party of Vietnam Central Committee and President Nguyen Phu Trong, and meet National Assembly Chairwoman Nguyen Thi Kim Ngan and Prime Minister Nguyen Xuan Phuc. 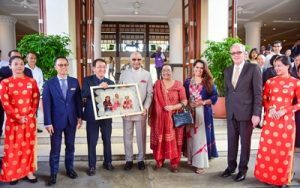 During the time in Danang, the President and his family received a well-prepared and meaningful gift from Furama’s board of directors with a photo of him and his family in the 30 Indian Bodhi leaves from the tree that was planted on the land of Danang. This is his first State visit to Vietnam also his first trip to Asia since he took office in July 2017. The President also addressed the Vietnam-India Business Forum in the Vietnamese capital. Speaking at the Business Forum event, the President said India and Vietnam are old civilisation friends, and trade is a driving force of our contemporary partnership. In the past eight years, there has been an almost four-fold increase in bilateral trade, from US$ 3.7 billion in 2010 to US$ 12.8 billion in 2017. With both Vietnam and India on a path of high growth, this trend is expected to continue. The President said the Vietnam-India business relationship presents prospects for engagement in financial services, IT and the digital economy, hydrocarbons, defence, renewable energy, mining, healthcare, tourism and civil aviation, among other sectors. 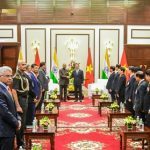 The President said Vietnam is a very important trading partner for India within ASEAN, and India is now among the 10 largest trading partners of Vietnam.